Lose That Girl: RATE IT! Blur Reunited? Take That Become Five? HATE IT! Want Some Steak with That Whine? RATE IT! Blur Reunited? Take That Become Five? RATE IT! Happy New Year! Happy New Franz! RATE IT! Muppet What-Not ~ An Experience! 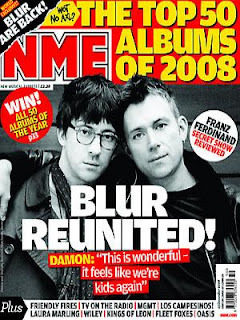 They say a picture is worth a thousand words, and this photo on the cover of the latest issue of Britain's NME proclaims all is well in the magical, musical world of Blur. But is it? Guess we have to read NME and see. I was going to say read it and weep but a reunion is supposed to be a good thing, right? I'm on team Graham Coxon for this one. Damon can be a bully & has been a piece of work in the past. Funny what getting older will make you do - experts say forgetfulness is one sign of aging! In other musical chair news, apparently Robbie Williams might be rejoining Take That. Plenty of hints on the Robster's website but nothing has been officially stated. Sounds like Rob is forgetting the past in order to cash in on the success of his former band mates. Hate to be skeptical but c'mon...it's Robbie afterall! To see Take That in their current quartet, click here for a glimpse of some seasonal cheer. Maybe Rob just wants to hang with some babes!